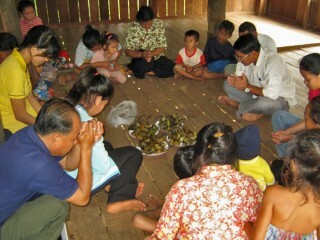 Some 35 years after the Khmer Rouge tore his world apart, a Samaritan’s Purse program manager in Cambodia is on a mission to restore families and ground them in the love of Jesus Christ. His aunt’s sallow face expressed what her words could not. When she finally steadied herself enough to tell her family what happened, her story seemed incomprehensible. Any hopes 9-year-old Bunren had for a happy childhood were dashed forever. Just days before, his father and uncle joined a group of villagers that headed into the forest in search of food. Hunger had driven them there, in spite of concerns defeated Khmer Rouge soldiers may be roaming the countryside. It was 1979, and the Vietnamese had overthrown Pol Pot’s brutal regime and liberated the labor camps. The worst was supposed to be over. But then this cruel news. Bunren’s beloved father, Rem, was dead. His uncle was clinging to life. Eyewitnesses said it was an ambush by the Khmer Rouge. Bunren was born in Boeng Chhouk village in northwestern Cambodia in 1970, the eldest child of peasant farmers. Some of his earliest memories involve bumping along in an ox cart when Rem brought him to the rice fields during harvest season. Men typically would leave the children at home with their mothers while they went to the fields to work all day. But Rem insisted on being a hands-on dad, both to Bunren and his two younger sisters. Those memories were few, however. The civil war erupted the year Bunren was born, creating immense upheaval. Pol Pot’s communist government wanted to turn Cambodia into an agrarian society devoid of any Western influences. Anyone who was educated, owned a business, or worked as a doctor, lawyer, teacher or in any profession was killed. 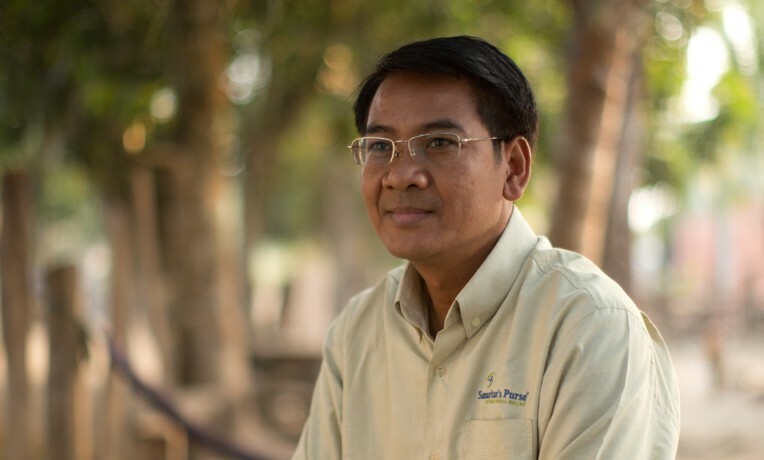 Samaritan’s Purse training programs in Cambodian villages help undo the damage wrought by the Khmer Rouge’s attempts to tear apart the family. During Khmer Rouge rule from 1975 to 1979, the Cambodian people suffered massive genocide. At least 1.5 million people were slaughtered, starved, or worked to death in labor camps. Some estimates have the number as high as 3 million. Perhaps the most devastating policy of the regime was its attempt to erase the family structure and destroy all relationships. Men, women, and children were often placed in separate work camps. Bunren does not remember how old he was when he was removed from his family and placed in a work camp, but he thinks it was around 6 or 7. He does clearly recall his assigned daily task of toting buckets of cow dung and tree leaves that were mixed together to make fertilizer for the rice fields. Children were forced to work long hours and only received a bowl of porridge for their labors. The camps also functioned as a training ground where Khmer Rouge leaders indoctrinated people of all ages in their ideology. But Bunren knew his parents loved him. One day, Rem showed up and spent a couple of hours. It was a day young Bunren relived many times in his heart. Two more years would pass before he saw any members of his family. In 1979, Vietnamese troops ousted Pol Pot and took control of Cambodia. They shut down the Khmer Rouge work camps and allowed Cambodians to return to their villages. Bunren, now 9, did not recognize the faces of his father or his mother when they arrived to take him home. An old snapshot shows Bunren’s family, circa 1990. The end of the war did not bring an end to their suffering. No jobs were available and there was precious little food. When they ran out of rice, his mother, Chin, boiled the husks. Once, Bunren watched Chin catch a rat and roast it for dinner. For weeks they dared not venture into the forest for oranges or wild game out of fear Khmer Rouge soldiers were hiding there. But now, facing starvation, they were out of options. About 40 villagers volunteered to make the dangerous trek, including Bunren’s father and uncle. Every day Bunren pestered his mother with the same question: “When is father coming home?” A few days passed into several more. Then, at long last, his aunt appeared at their door delivering the shocking news. The group had been attacked by Khmer Rouge soldiers. His father was dead. After Rem’s death, Bunren’s family felt their only option for survival was to flee across the border into Thailand. For most of the next 13 years, they lived amid squalor and despair in a series of refugee camps. There was never enough food. The women in the camps would stand in long lines to receive their family’s portion of rice. One day, Bunren’s mother and grandmother concocted a scheme to take advantage of his height and long hair. The disguise worked beautifully twice. But on the third occasion, his true identity was discovered. “People were staring at me. Some of them were people who knew me. I was so embarrassed,” he said. 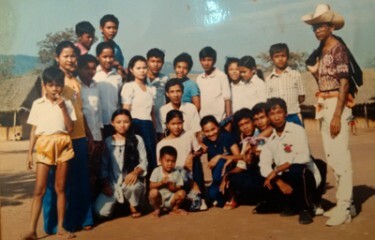 When he finally was able to attend school, Bunren (top row, fifth from right) excelled at his studies. At the age of 12 or 13, Bunren finally was able to start school. Never mind that he was the oldest kid in first grade; he studied hard and finished as one of the top students every year. When he wasn’t in the classroom, he helped his grandmother sell rice cakes for extra income. But he was not happy. Quiet and reserved, he shared little of the tumultuous emotions stirring in his heart. In his early 20s, Bunren decided it was time to strike out on his own. He continued to harbor resentment in his heart and hoped a fresh start would ease the pain. He was confident he could leave the refugee camp without legal permission and find a construction job in Bangkok. But he could not foil the authorities. Bunren was arrested by Thai police and sentenced to six months in prison. During that time he received a letter that rocked his world. His mother had died. At age 23, Bunren felt more alone than at any time in his life. He was beginning to believe the harsh words of the Khmer Rouge. Maybe love did not exist. If it did, it certainly didn’t last for long. His mother often spoke of returning home to Cambodia. He was determined to go on her behalf and build a new life that would make his family proud of him. The following year the United Nations provided an open door for refugees to return home. Bunren found work in the capital city of Phnom Penh. He didn’t know it at the time, but God had led him back to his homeland for a special purpose. Bunren had prayed to receive Jesus as his Savior when he was 15, but it didn’t have much impact on his life. Attending Bible school helped equip Bunren to serve Christ. 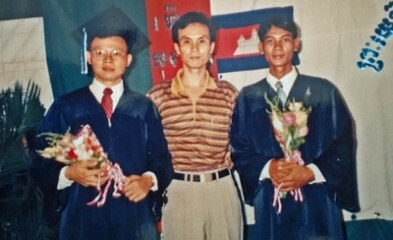 By God’s guiding hand, an opportunity arose to attend a Bible college in Phnom Penh. Those three years changed the direction of his life. The Scriptures came alive and Bunren felt God speaking personally to him. It was a liberating decision. Desiring to share this message of peace with others, Bunren became a pastor. He felt burdened, however, by the many unmet physical as well as spiritual needs that he saw. Bunren meets with the director of a health care facility. He began working for World Vision and then joined Samaritan’s Purse in 2013 as a project manager for the Maternal and Child Health program. Last May, he moved into a position that is very dear to his heart—manager of the Strengthening Women and Families program. Now his mission is to restore the fabric of families in Cambodian society and to encourage relationships that are God-honoring and built on mutual love and respect. 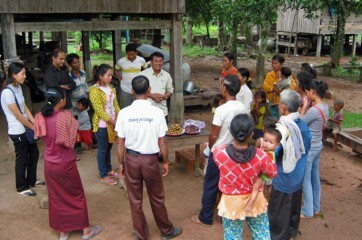 He and a team of trainers educate the community about the rights of women and children. They offer practical instruction on maintaining a healthy marriage, parenting skills, financial planning, and preventing domestic abuse. The program also teaches the healing power of forgiveness, something that Bunren did not understand until he committed his life to Christ. 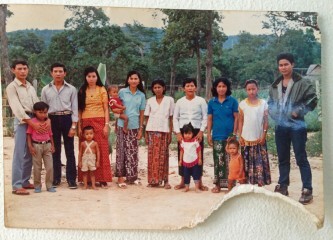 The uncle who survived the vicious attack by the Khmer Rouge soldiers in the forest in 1979 told Bunren he knew the identity of the man who killed his father. Bunren prefers not to know. He said he has forgiven the man—whoever he is—and God has given him peace to truly leave the past behind. His position as manager of the Strengthening Women and Families program gives Bunren ample opportunities to share the love of Jesus with his countrymen. God also has given him a wonderful family of his own. Bunren and his wife, Savoeun, have a 5-year-old son, David, and a 2-year-old daughter, Rebekah. He still misses his father and mother, but he believes the best way he can honor them is by loving his children. Most of all, he wants his son and daughter to know the love of Jesus, and he considers that his greatest calling in life. “Because of my childhood experiences, I spend a lot of time with my boy and girl,” he said. “That time is invaluable. I won’t live forever and I want my children to depend on God, not on me, in the future.